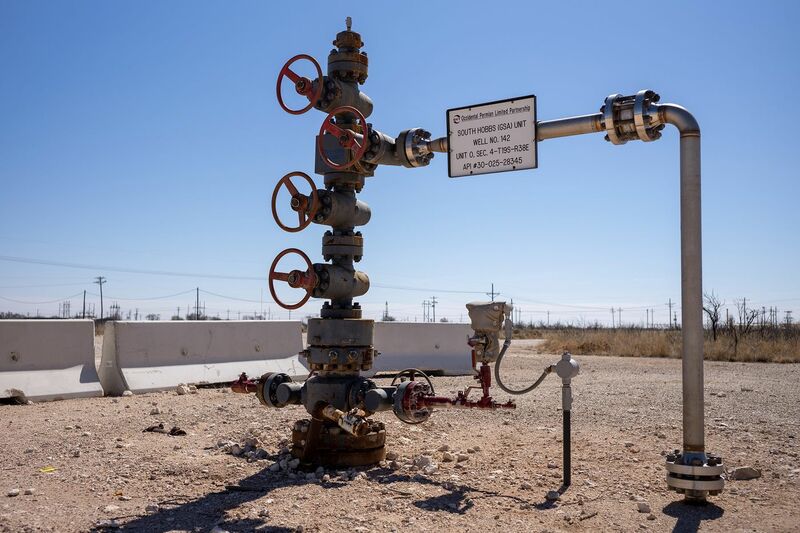 Hodges, a 57-year-old manager with Occidental Petroleum Corp., runs a cluster of installations at the Hobbs oil field, where dozens of wells don’t pump a single barrel of oil but instead do the opposite: push stuff — lots of it — into the ground. Occidental runs the operation in southeast New Mexico as part of its so-called enhanced-oil-recovery program, injecting carbon dioxide and water underground to force out crude that might otherwise languish in the reservoir. EOR already works in conventional oil fields — now the company is trying to make it work commercially in shale rock. If Occidental and its rivals’ experiments with similar techniques are successful — a big if, in the view of many others — it could further transform the Permian, which is already the world’s largest oil patch. To do that, knowing how the oil, gas, CO2 and water work together thousands of feet below the Earth’s surface is crucial. “The guys who know what’s happening underground is the RSG,” Hodges says in reference to the company’s Reservoir Study Group. “That stands for the really smart guys,” he adds, laughing. While the U.S. shale revolution has boosted American oil production to a record, it’s also leaving lots of crude in the ground. At best, fracked wells only recover about a 10th of what the industry calls the oil-in-place. Hobbs is a conventional Permian field, developed decades before engineers figured out how to drill horizontally and then inject huge amounts of water, sand and chemicals to open up fractures in the rock, freeing hydrocarbons from shale reservoirs. Across the U.S., there are over 80,000 shale oil and gas wells more than five years old, pumping a trickle of hydrocarbons. They provide a massive opportunity for anyone who can figure out how to extend their life and extract a few extra barrels. Achieving that would be especially welcome in the shale industry, which is currently compelled to invest more each year in new production just to offset the natural decline of its older wells. The challenges are daunting, however. In conventional rock, EOR engineers inject CO2 and water via one well, flooding the reservoir and pushing the oil and gas out of another well. It’s a lot more difficult for shale. For a start, the temperature and pressure need to be just right for the CO2 to mix with the oil. Furthermore, the CO2 and water struggle to move through the tightly packed rock. While Occidental is testing the conventional method of different wells for shale, it’s also piloting a different technique that uses one well for both injection and production. Occidental isn’t alone. Chevron Corp., which is expanding fast in the Permian, has lots of experience with EOR outside of shale, particularly in mature fields in California. EOG Resources Inc., the largest independent shale producer, is experimenting with the injection of natural gas. Globally, the International Energy Agency estimates there are more than 166 EOR projects using CO2, producing about 450,000 barrels of oil a day. By 2040, it anticipates output from similar projects will almost quadruple to 1.64 million barrels. The method also has the advantage of potentially sequestering the gas and helping the fight against climate change. “There’s a great appetite for EOR, because it’s good to the financial aspect but also the environmental aspect,” Fatih Birol, the head of the International Energy Agency, said in an interview. If the technology works in shale, Occidental and its rivals will still need to figure out how to make it economic. In conventional Permian fields, CO2 injection could add another $6 per barrel to the cost of extracting the crude. 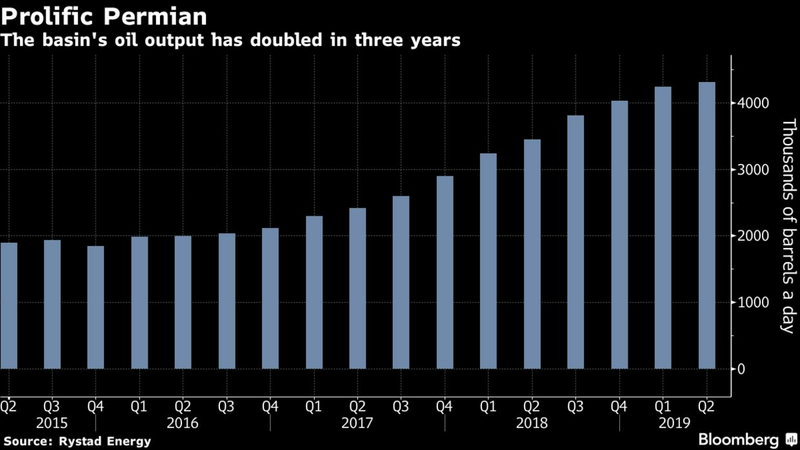 With West Texas Intermediate trading at around $60 a barrel, that’s a significant add-on, especially as drillers have come under more pressure to improve returns to investors. However, the U.S. government is providing some help with tax credits to oil producers who store CO2. Occidental has told investors it hopes to declare EOR viable later this year and give its first commercial project the go-ahead in 2020. Hollub is confident it already works.